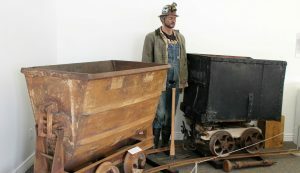 The Brigham City Museum features fossils, Box Elder County mining memorabilia and other interesting items. The collection is housed in the old Bunderson Elementary School building. 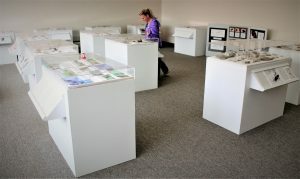 Ronald Cefalo is in his element as the curator of the Box Elder Museum of Natural History, located at 641 E. 200 N. in Brigham City in Bunderson Elementary School. Sammy Oberg checks out insect fossils at the Box Elder Museum of Natural History. The retired college professor of sciences spends his time in the spring and fall going to schools and promoting the collection of specimens housed in an old elementary school. 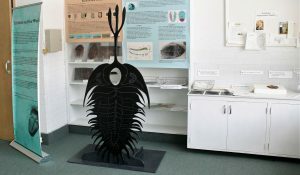 The Box Elder museum boasts the best display of trilobites in the western U.S. The fossils come from many parts of the world. They secured a place in the old Bunderson Elementary School, where the city recreation office is located. Gunderson’s collection was put in one of the classrooms, it took half of the area back in 2009. Then something magical happened, it grew. They went from a half classroom to six classrooms with displays down the hall. Inside those classrooms are minerals, fossils of bugs, trilobites and fish. There is also a room dedicated to mines in Box Elder County. And the florescent mineral display is a big draw. The mining display has artifacts, ore samples, mining cars and other relics from old mines in Box Elder County. One room at the Box Elder Museum of Natural History is dedicated to the mining industry in Box Elder County. Box Elder High School has a chemistry class that enjoys Chemistry Night at the museum. They come and find elements on the periodic chart in the raw form. As far the curator knows, it is the only one like it in the state. He said a gentleman from the Denver Museum of Natural History looked over the collection and told them there is not another museum like this west of the Mississippi. 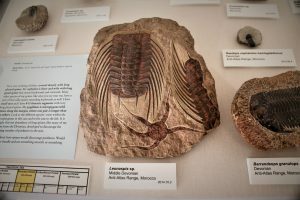 The Museum of Natural History has 176 trilobites and the collection is expanding. One of the rooms has visual aids to help explain the history of the ancient creature. The museum also has geodes from Brazil, ripple stones from the San Rafael Swell and dinosaur footprints. Other fossils on display document the history of the world for millions of years, and include dinosaurs, ancient horses and sharks, plants, and insects. Cefelo said they are a no charge museum and they still accept museum quality specimens, like petrified wood, to fossils; they will take anything. The museum is open Monday through Thursday from 10 a.m. to 5 p.m. They are also open Friday from 10 a.m. to 1 p.m. and Saturday from 1 p.m. to 5 p.m.